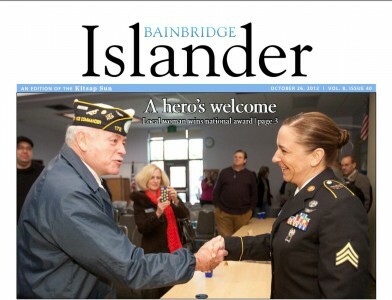 Here’s the Friday preview: Bainbridge edition for Oct. 26. Feel free to give your events a plug in the comment section below. Read the Sun’s regional Friday preview here. Weather: If you like rain with your clouds you’ll love this weekend’s weather. Rain is likely tonight through Sunday with temperatures in the low 50s, according to the National Weather Service. Sports: The Spartans are grinding into postseason and the football team was surprised to find itself in the playoff hunt. Bainbridge plays West Seattle at 5 p.m. Saturday at Memorial Stadium in Seattle for the seventh spot in the district playoffs. The swim team already boasts an impressive list of athletes qualified for state. See a full sports schedule here and follow the Sun’s PrepZone page on Facebook for playoff updates. Halloween is officially next Wednesday, but the weekend is packed full of spooky events nonetheless. For the second weekend, visitors can experience “Blackbeard’s Bilge,” a haunted event in the basement of the Battle Point Park Transmitter Building. The “Bilge” is open 7-10 p.m. Friday and Saturday and entry is $5 ($10 for a group of three). Consider this event PG-13 rated (not appropriate for young children). Island Center Hall hosts a night of live storytelling beginning at 6:30 p.m. Saturday. The fright-level will rise through the evening beginning with stories for very young children and concluding with stories for teens, along with an open mic session. Tickets are $5 in advance or $10 at the door. Find full details here. Bring a pumpkin and carving tools to IslandWood from 1-5 p.m. Sunday to craft Jack-o’-lanterns with the help of kitchen staff. Other HOWL-o-ween festival events will spice up the night. Costumes encouraged. And finally, we know it’s not a weekend event, but the island’s Trick or Treat Downtown event will be held 4-6 p.m. Oct. 31 in Winslow. Inside the Islander: Julia Bringloe’s bravery in Afghanistan put her among an elite class of flyers. The City Council green-lighted a new crosswalk for Sportsman Club Road schools. 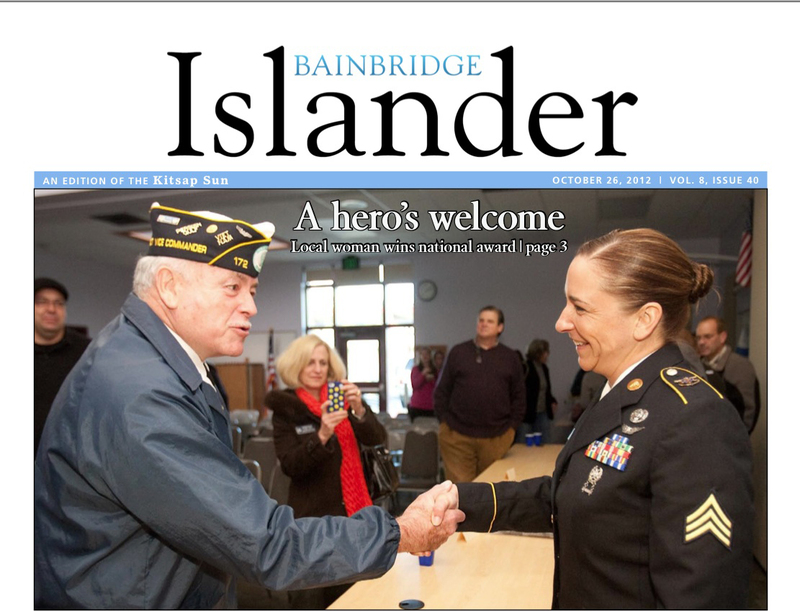 Islanders welcomed former Bainbridge High student Julia Bringloe who earned the Distinguished Flying Cross for bravery. The city agreed to pay nearly $1.4 million to the family of the mentally ill man shot by police in 2010. WSDOT is studying improvements to the Suquamish Way/Highway 305 intersection (but don’t expect a bridge expansion). Property owners want the U.S. Supreme Court to hear their lawsuit over a Blakely Harbor dock ban. Islander and state House candidate James Olsen was ordered to stop using the state seal on campaign ads. Coming Up: The island’s ban on plastic bags at checkout counters begins Nov. 1.